10 Best Places To Visit In Dubai - Travel Tips - TryThis! Ahlan Wa Sahlan! Welcome to the United Arab Emirates. The largest city in the UAE is well known for its plethora of wealth and opulence (a vending machine for gold, anyone? 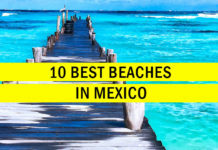 ), but it is also known for its history and culture. A city like no other, Dubai is the story of the little fishing village that could, and of a city that has made it big – at least as far as opulence and grandeur is concerned. 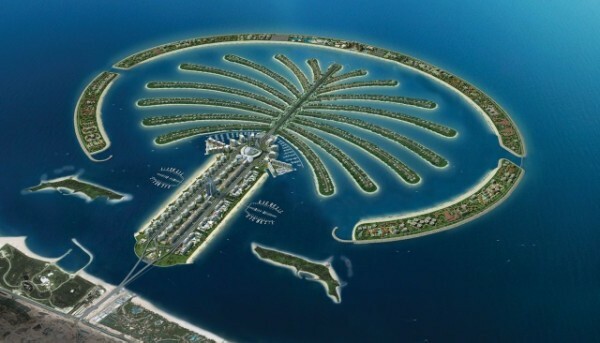 Discover man-made islands sculpted into the shapes of palms and a tower so high it is almost a kilometer tall. Explore the best Dubai tourist places by taking a tour of the heritage area of Bastakiya, wander the spice and gold souqs, and see more supercars in one day than you are likely to see in a year as you walk the streets of this desert town. It is easy to fall in love with Dubai because it is full of character. Most attractions and diversions are open as usual and looking for places to visit in Dubai may be a bit of trouble without proper help. 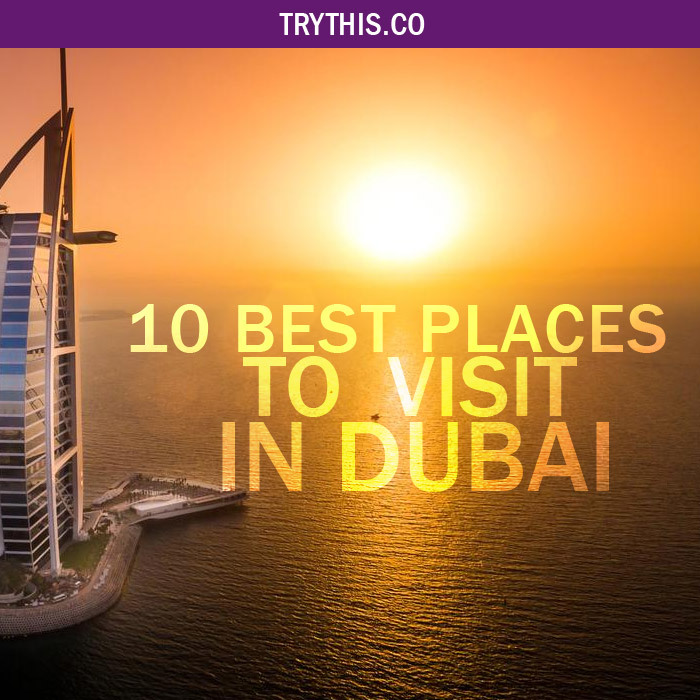 To help, we have pulled together a list of some of the best Dubai tourist places when you visit the city. Dubai’s internationally famous Gold Souk has its roots in the 1940s when Indian and Iranian traders began setting up stalls in the area. Today it is one of the world’s busiest jewelry markets, with hundreds of shops and stalls selling just about everything that glitters, namely, gold. An estimated 20 percent of the world’s gold passes through the souk. 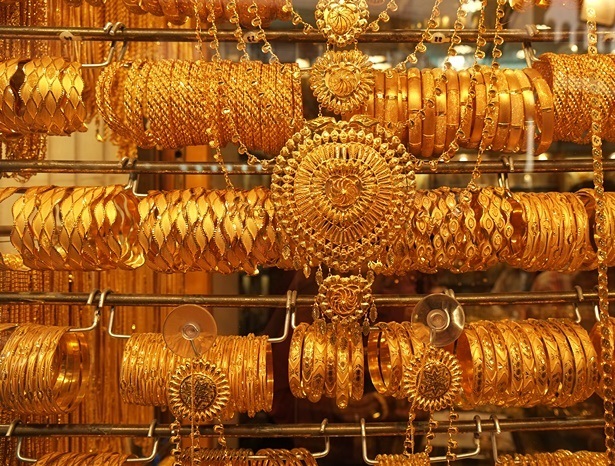 While visitors shopping for gold can land some incredible deals in the Dubai Gold Souk, even non-shoppers will be impressed by the sheer spectacle of it. The souk is a popular stop on Dubai tourist places, which help visitors navigate plenty of retailers. There are plenty of deals to be had at the Gold Souk and remember that friendly haggling is expected. This is first one of the places to visit in Dubai. The Burj Khalifa is the tallest building on the planet, set in a stepped design that narrows as it climbs, syringe-like, to the sky. The design is patterned after the repetition of a single geometric shape, meant to echo Islamic art and is one of the must-see Dubai tourist places and tops the list of places to visit in Dubai. Bringing a new meaning to the term skyscraper, the building is part of the massive downtown Dubai complex of offices, hotels, shopping malls, entertainment precincts, and apartment buildings. 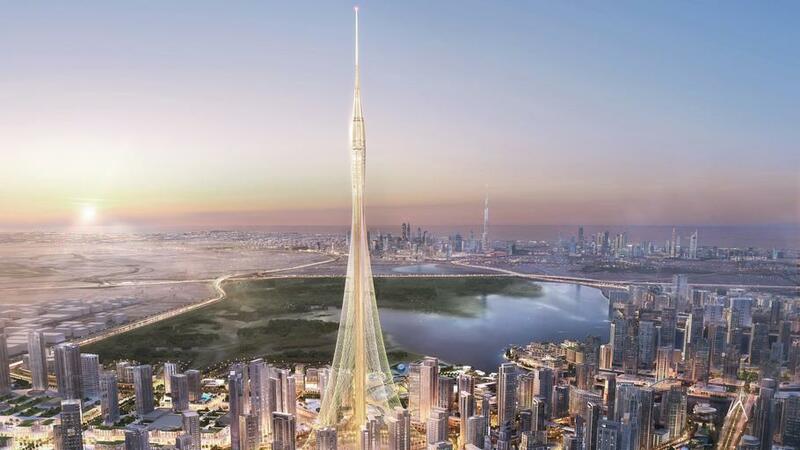 With a Burj Khalifa admission ticket, travelers can ride the high-speed elevator to the 124th-floor At the Top observation deck for stunning 360-degree views over Dubai and the Persian Gulf. 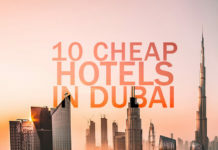 If you would rather not get so high, wander through the gardens and fountains of Burj Khalifa Park, or shop till you drop at the Dubai Mall, located inside the building. Along with a huge variety of shops such as Galeries Lafayette, Bloomingdale’s, and Marks & Spencer, the mall features an aquarium, ice rink, Sega theme park, and movie theater. Chances are, if you are visiting Dubai, you will want to spend some time at the beach. 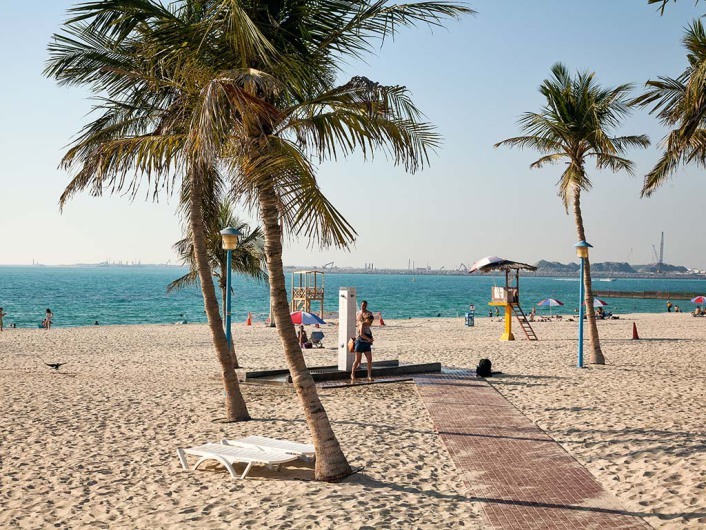 While many of the big resorts limit beach access to guests only, the city has a handful of public beaches, and Jumeirah Beach Park is by far the best of them. Jumeirah Beach Park is the first beach park in Dubai and most of the time the first place to come to mind if you ask which places to visit in Dubai. Today, the 30-acre beachfront green space features volleyball courts, showers, playgrounds, picnic tables, food kiosks, barbecue areas and lifeguards monitoring the sandy stretch of beach. The facilities are the best you will find on pretty much any public beach. 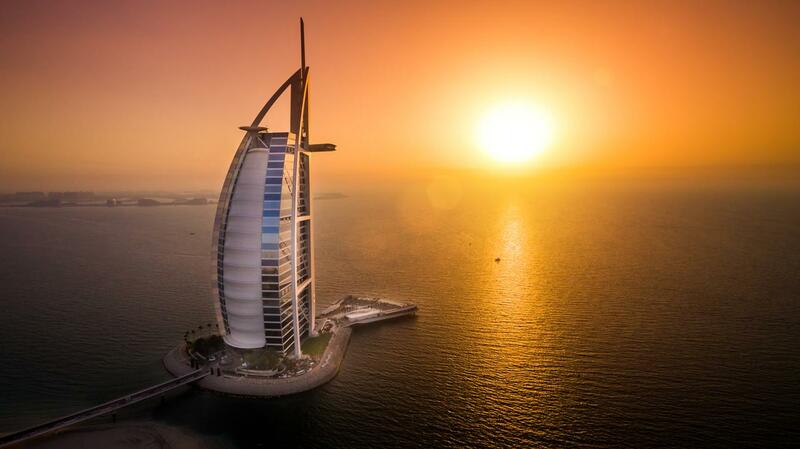 The sail-like silhouette of the Burj Al-Arab has become a symbol of Dubai’s opulence and affluence. 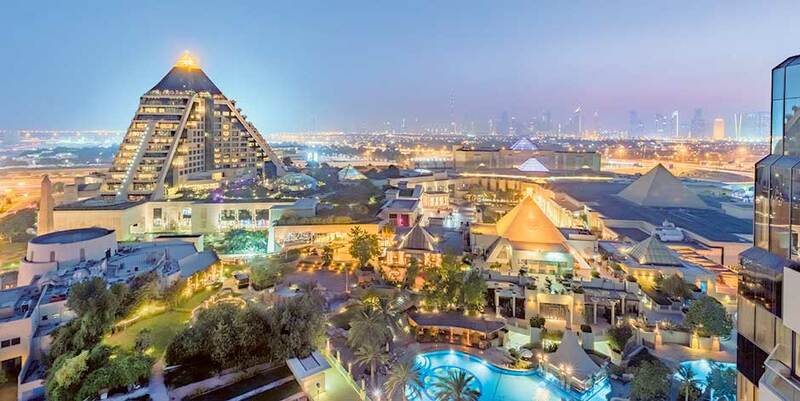 Besides shelling out to stay the night at the Burj Al-Arab, visitors have plenty of other options for viewing and touring the sumptuous landmark, which can be spotted from numerous spots around Dubai. The Sahn Eddar Lobby Lounge offers a decadent seven-course afternoon tea service, set to the sounds of live classical music with views of the hotel’s amazing atrium, while the 27th-floor Skyview Bar and its floor-to-ceiling glass windows mix cocktails with stellar views over the Dubai skyline and the Persian Gulf. Hungry visitors can book a traditional Arabic lunch inside the world’s tallest atrium at Al Iwan, or go for a more international menu with views over the city at the 27th-floor Al Muntaha. This most definitely is the next in line for places to visit in Dubai. Although the Burj Al-Arab is known for its height, it technically only has 28 inhabited stories. 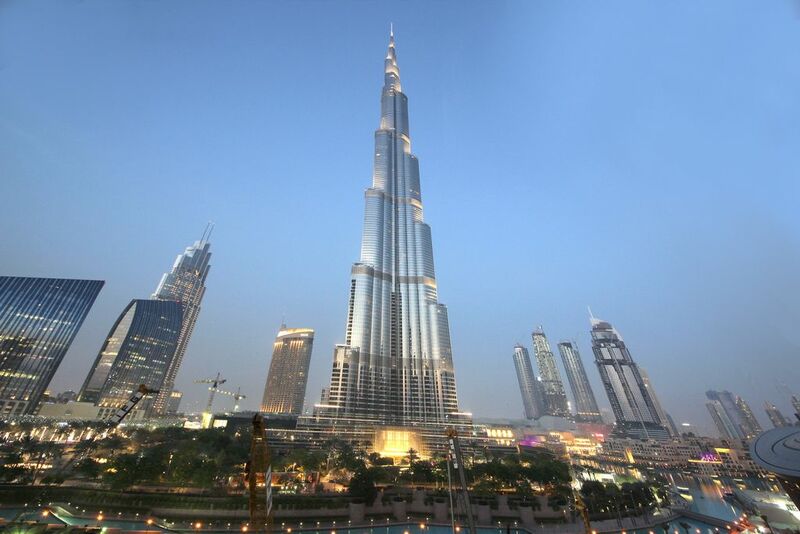 If its views you are after, only a visit to the world’s tallest building, the nearby Burj Khalifa, will suffice. At this point which places to visit in Dubai should not be a problem anymore. So here is another we recommend. 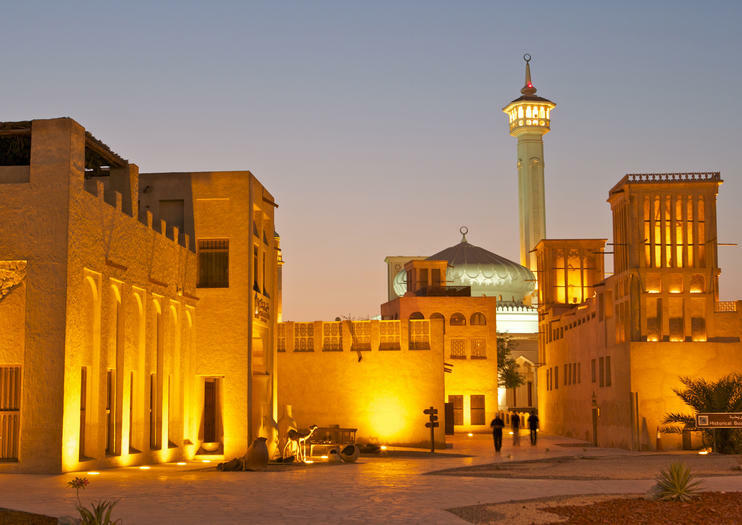 The lovely Bastakia Quarter, or Bur Bastakia, is Dubai’s, historic heart. Here, in the narrow-whitewashed lanes overlooked by lofty wind towers of traditional courtyard houses, the glitz and glamor of Sheikh Zayed Road and the Mall of the Emirates feel centuries away. This is a place for wandering and soaking up the atmosphere, catching glimpses through shuttered gateways into the tranquil courtyards of traditional homes, hearing the sound of trickling fountains and seeing sprays of purple bougainvillea add a dash of color to the passageways’ high whitewashed walls. Several of the gorgeous courtyard buildings host art galleries showcasing the work of local artists, and their garden cafes provide a relaxing oasis. A colorful souq market is held here on Saturdays, featuring books, arts and crafts, and fashion. Dubai may have the world’s largest shopping mall, but for many visitors, the best shopping is found in the city’s traditional souks or markets. 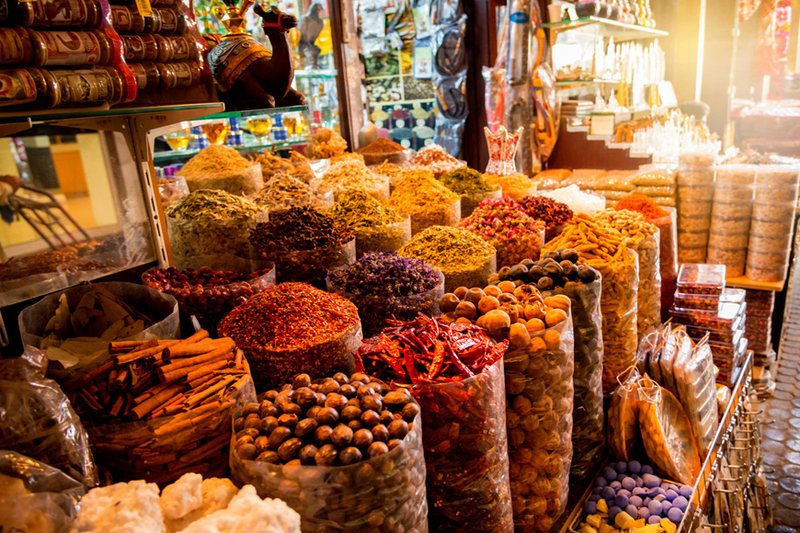 Each of these historic markets specializes in one product or category of products, and one of Dubai’s most famous as well as most pungent souks is the Spice Souk. Located in the eastern part of Dubai next to the Gold Souk, the Spice Souk includes a small area of narrow lanes lined by small shops selling almost any spice you can imagine. Huge bags and bins of colorful and fragrant spices, everything from frankincense and saffron to dried chilies, overflow into the streets. You will also find shops selling incense and sheesha, a type of tobacco smoked in a water pipe. 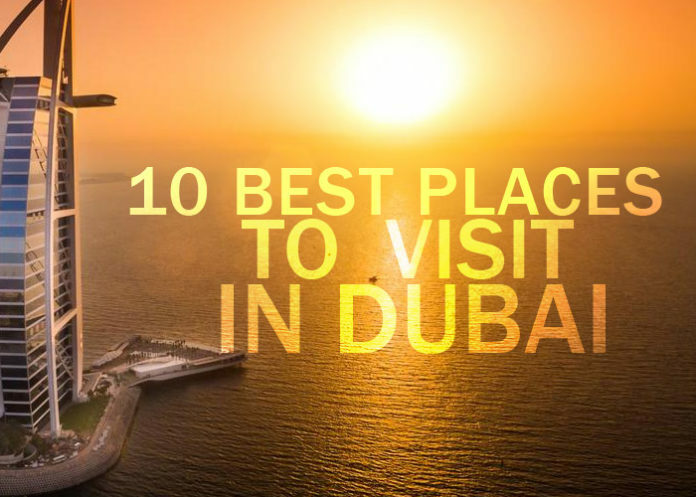 This place most definitely dominates the charts for places to visit in Dubai. If you come to buy spices, be prepared to haggle; knowing your basic numbers in Arabic will help. Even if you are not in the market for spices, a trip to the Spice Souk is worth an hour of your time just to soak up the atmosphere of one of the few remaining places where you can catch a glimpse of a more traditional Dubai. Which places to visit in Dubai can get confusing if you don’t know what to look for and where. The seawater Dubai Creek (Khor Dubai), flowing between Deira and Bur Dubai in the historic center of the United Arab Emirates city of the same name, is the reason for Dubai’s very existence. When trade with the outside world began over a century ago, this protected inlet was the obvious choice to develop a commercial seaport. The creek has been widened many times during the last century, and today, it is often busy with abra, small wooden water taxis, ferrying passengers between the souks of Deira on the north-eastern bank and the historic district of Bur Dubai on the southwestern bank. While water taxis are often included as part of guided sightseeing tours and serve as a practical way to see the sights of Dubai Creek, the waterway can also be enjoyed via a sunset dinner cruise aboard a traditional Arabian wooden sailboat known as a show. Fly over Dubai and you will notice something unusual about the shoreline, the unique shapes of Palm Islands and the World, some of the world’s largest artificial islands. From above, these islands resemble a trio of palm trees, i.e., Palm Jumeirah, Palm Jebel Ali, and Palm Deira, and a roughly circular world map, golden on the otherwise azure surface of the Persian Gulf in the United Arab Emirates. Although the palms are mainly home to a mix of leisure, residential, marina, and commercial structures, visitors need not own property on the completed Palm Jumeirah or any of the other islands to get a good look at this manmade wonder. Tours by speedboat, rigid-inflatable boat, and jet ski take visitors from the Dubai Marina to the Palm Jumeirah archipelago, where it is possible to see the 5-star hotels tower above the water and spot the Burj Al-Arab from afar. The best views of the Palm Islands and the World are from the air. Flightseeing tours aboard a helicopter or seaplane provide the perfect bird’s-eye views of these impressive archipelagos. Wafi City Mall is one of the most architecturally interesting of Dubai tourist places. The exterior of the Egyptian-themed mall borders on kitschy, but once inside, visitors find plenty of shops and restaurants, many of the international luxury brands. A highlight of a visit to Wafi City Mall is the Souq Khan Murjan, a modern recreation of a traditional fourteenth-century bazaar where vendors sell arts and crafts from across the Arab region. Within the mall, families can play glow-in-the-dark mini golf at Tee and Putt and kids can run off some energy at Kids Connection, a large indoor play center, and arcade. Each evening, the mall hosts a free light and sound show in its central courtyard. Visit Dubai to experience this one of a kind mall that tops the list of places to visit in Dubai in a traveler’s interest. The Bedouin people are a desert-dwelling ethnic group found throughout the Arabian Peninsula. While rapid modernization throughout the region has led a majority of these former herders and nomadic traders to seek new livelihoods in the cities, it is still possible for visitors to experience a night in a traditional Bedouin camp. Located in the dunes of the Dubai Desert far from any signs of permanent human habitation, these camps offer visitors a glimpse into what it might have been like for a Bedouin family trying to survive in the harsh desert landscape. A typical evening will include a barbecue dinner, shared while seated on Arabian rugs, a belly dancer and time to chat over a hookah — a type of water pipe used to smoke shisha. 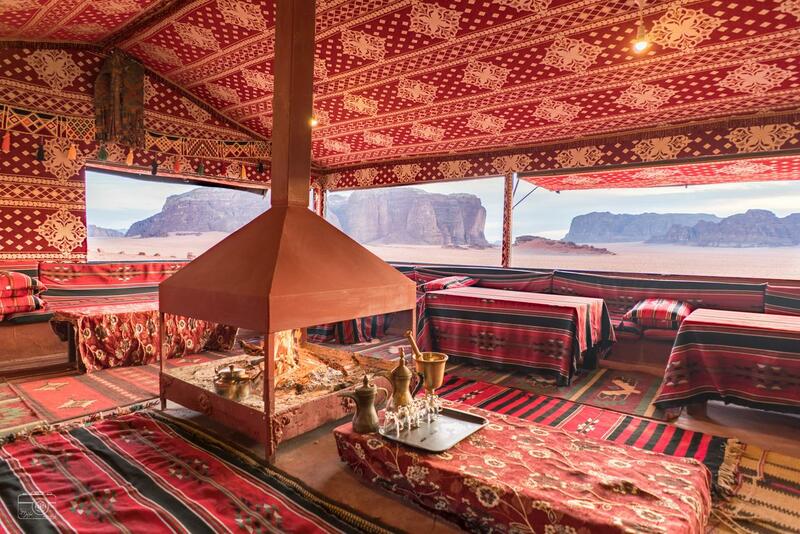 The experience could end there, or you can opt to spend the night at this desert camp beneath the stars. To make the most of your time in the desert, combine your Bedouin camp experience with a camel safari or sand boarding excursion.